This article is about a Polish dynasty. For other uses, see Piast (disambiguation). The Piast dynasty was the first historical ruling dynasty of Poland. 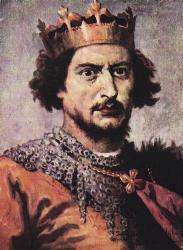 The first documented Polish monarch was Prince Mieszko I (c. 930–992). 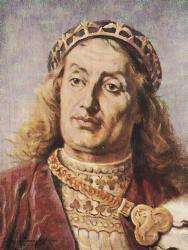 The Piasts' royal rule in Poland ended in 1370 with the death of king Casimir III the Great. Branches of the Piast dynasty continued to rule in the Duchy of Masovia and in the Duchies of Silesia, until the last male Silesian Piast died in 1675. The Piasts intermarried with several noble lines of Europe, and possessed numerous titles, some within the Holy Roman Empire. 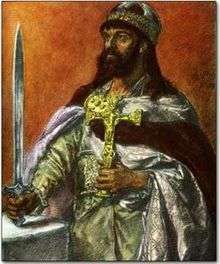 The early dukes and kings of Poland regarded themselves as descendants of the semi-legendary Piast the Wheelwright (Piast Kołodziej), first mentioned in the Cronicae et gesta ducum sive principum Polonorum (Chronicles and deeds of the dukes or princes of the Poles), written c. 1113 by Gallus Anonymus. 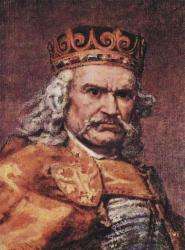 However, the term "Piast Dynasty" was not applied until the 17th century. 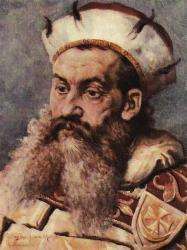 In a historical work the expression Piast dynasty was introduced by the Polish historian Adam Naruszewicz, it is not documented in contemporary sources. The first "Piasts", probably of Polan descent, appeared around 940 in the territory of Greater Poland at the stronghold of Giecz. 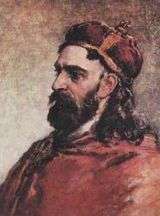 Shortly afterwards they relocated their residence to Gniezno, where Prince Mieszko I ruled over the Civitas Schinesghe from about 960. The name Polani, from Slavic: pole ("field"), did not appear until 1015. 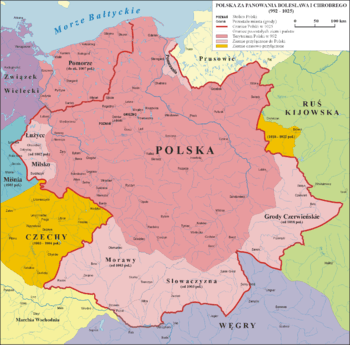 The Piasts temporarily also ruled over Pomerania, Bohemia and the Lusatias, as well as Ruthenia, and the Hungarian Spiš region in present-day Slovakia. The ruler bore the title of a duke or a king, depending on their position of power. The Polish monarchy had to deal with the expansionist policies of the Holy Roman Empire in the west, resulting in a chequered co-existence, with Piast rulers like Mieszko I, Casimir I the Restorer or Władysław I Herman trying to protect the Polish state by treaties, oath of allegiances and marriage politics with the Imperial Ottonian and Salian dynasties. The Bohemian Přemyslid dynasty, the Hungarian Arpads and their Anjou successors, the Kievan Rus', later also the State of the Teutonic Order and the Grand Duchy of Lithuania were mighty neighbours. 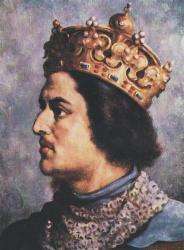 The Piast position was decisively enfeebled by an era of fragmentation following the 1138 Testament of Bolesław III Krzywousty. For nearly 150 years, the Polish state shattered into several duchies, with the Piast duke against the formally valid principle of agnatic seniority fighting for the throne at Kraków, the capital of the Lesser Polish Seniorate Province. Numerous dukes like Mieszko III the Old, Władysław III Spindleshanks or Leszek I the White were crowned, only to be overthrown shortly afterwards. The senior branch of the Silesian Piasts, descendants of Bolesław III Krzywousty's eldest son Duke Władysław II the Exile, went separate ways and since the 14th century were vassals of the Bohemian Crown. 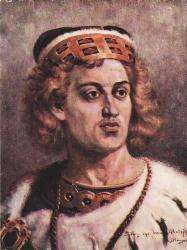 After the Polish royal line and Piast junior branch had died out in 1370, the Polish crown fell to the Anjou king Louis I of Hungary, son of late King Casimir's sister Elizabeth Piast. The Masovian branch of the Piasts became extinct with the death of Duke Janusz III in 1526. The last ruling duke of the Silesian Piasts was George William of Legnica who died in 1675. His uncle Count August of Legnica, the last male Piast, died in 1679. 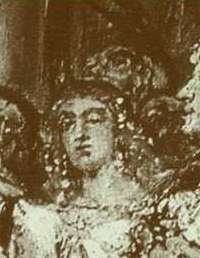 The last legitimate heir, Duchess Karolina of Legnica-Brieg died in 1707 and is buried in Trzebnica Abbey. Nevertheless, numerous families, like the illegitimate descendants of the Silesian duke Adam Wenceslaus of Cieszyn (1574–1617), link their genealogy to the dynasty. 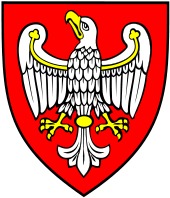 About 1295, Przemysł II used a coat of arms with a white eagle – a symbol later referred to as the Piast coat of arms or as the Piast Eagle. Piast kings and rulers of Poland appear in list form in the following table. For a list of all rulers, see List of Polish monarchs. 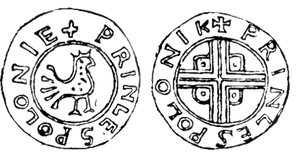 Denar Princes Polonie, 11th century (in the times of Bolesław I Chrobry), one of the most famous coins in the history of Polish coinage. ↑ A. Małecki, Studya heraldyczne [Heraldic Studies], vol. I, Lwów 1890, pp. 268-285; M. L. Wójcik, Ród Gryfitów do końca XIII wieku. Pochodzenie — genealogia — rozsiedlenie, Historia CVII, Wrocław 1993, p. 39. ↑ "Piast Dynasty". Encyclopædia Britannica. Retrieved 30 March 2011. The name Piast was not applied to the dynasty until the 17th century.